I took some time off right before my final year of college. Instead of simply not enrolling for a semester or two, I went through the formal withdrawal process. That was a big mistake. While I was away from school, tuition prices skyrocketed. Had I not withdrawn, I would have been grandfathered under the old tuition rates. Instead, I faced a 400% tuition increase. I had already been covering some of my tuition with student loans, but I didn’t want to use more. I had a choice: either transfer to a cheaper school, or figure out how to pay the extra tuition without loans. Transferring to another school meant delaying graduation, since not all my credits would transfer. In a desperate attempt to stay with my university, but not pay more than I had to, I called the Financial Aid Office and asked for help. I had always had a small academic merit scholarship, and after the discussion with them, the size was increased. The increase didn’t cover all I needed, but it was more than I had before I made the call. I then worked hard to cover the rest of the gap. The fall college semester is almost here. Chances are, you’ve decided how you’re going to pay for tuition. If you decided upon student loans, was that the only option you stopped to consider? Student loans are just one way to pay for college. They’re easy to get just like payday loans from Snabblån365.com, but they’re also something you’ll have to pay for years to come. Affording the minimum payments might mean forgoing some needs and wants for up to 20 years. If you can force yourself to look that far into the future and see the impacts on your life, you might change your mind about using student loans. It can seem impossible to avoid student loans, but every year students graduate from college without any debt (and no, not all of them have rich parents). You can be student loan free, too – or you can at least minimize the loans you take out. Scholarships and grants aren’t the only alternatives to student loans. Just like I did, you can contact your financial aid office and see what else they can offer you. It’s late in the game, but sometimes last minute requests are beneficial; if they have a pot of money they haven’t awarded, now’s the time to snag it! The discussion doesn’t have to be based off just the fall semester. The Financial Aid Office might to tell you that you can get an award in the spring if you raise your grades, for example. Working while you’re in school is difficult. School is a full-time job all on its own, so working means adding another part-time (or full-time!) job on top of your full schedule. Of course, school isn’t a nice 8-5 deal, either. One semester you might need a class that starts at 7 pm, but the rest of your classes are during the middle of the day. That makes fitting in work even harder! Your primary focus should be school. You want to earn good grades in order to land a good, high-paying job in a few years. The key is to find a job with decent pay that provides the flexibility you’ll need. Many campuses offer low-paying part-time jobs through work-study programs. These jobs tend to be very understanding of student schedules, but the hourly pay is low. It’s rare to find campus opportunities that need more than 20 hours. You might need to look for an off-campus job; ask friends how flexible and understanding their employers are. Bonus if you can find a position that allows you to study when business is slow. You might be enrolled for the fall semester, but that doesn’t mean you have to start then. If you were to live at home and work instead, could you save enough money for the spring semester? Or do you think you could find additional scholarships and grants? You don’t have to put off school indefinitely or until you can pay your entire tuition bill. One semester is enough time to save up a little money, which means you’ll take out fewer loans. In the future, you can use your summer breaks to set aside money for the following school year. Many schools, both public and private, don’t require the full tuition payment at the start of the semester. Look into what payment plan options are offered. Note that the tuition for one semester will need to be paid off before you enroll for the next semester. Be sure to factor in any interest rates or fees that might come with this type of option. Your parents may not have money for your college education, but unless you’ve already had a serious talk with them about tuition, now is the time to ask. Prepare your thoughts and data beforehand. Tell them what you’re doing to pay for tuition yourself. Show them how much money tuition is and show them how much you’re contributing through work, scholarships, or grants. Show them what your monthly student loan payments will look like if you borrow that much money every semester. Then ask them if they can help out or if they know of other family who might be willing to help – either in the form of a gift or a loan. Even if they can’t contribute the full amount, anything that lowers your student loan payment is a huge bonus. If your family offers you the money in the form of a loan, investigate whether their interest rate is better or worse than what you could get with a student loan. It might not make sense. Also, make sure terms are documented and clear to both parties. As with most decisions in life, sometimes the best thing to do is to use all the options. Perhaps mom and dad can contribute a few hundred dollars. Perhaps you take a semester off and work to save a few hundred more. Perhaps the Financial Aid Office kicks in another grand in scholarships. Then you can start in the spring, using a tuition payment plan that you pay off by working during the semester. Another example might be that your family helps you afford one semester, and you work to put aside money for the next semester, using a tuition payment plan if necessary. Then you can set aside more money during the summer semester to afford the following fall semester. If you choose to take time off to work, or if you choose to work during school (or both), you’ll have a leg up on your competition when you graduate from school. You’ll have a solid work history to present to employers – even if that work history doesn’t seem directly applicable to your career field. Many employers are wary of new graduates because they’re the great unknown – can they commit to this job? Will they show up on time? Do they understand how to act professionally? Having a solid work history alleviates these fears. This is one reason it’s important to find a job that works well with a student schedule; while it’s not unexpected that students will job-hop a bit through college, if you stay with one employer for an extended period of time, you’ll prove that you’re able to commit – even when life is stressful. Another alternative is to investigate whether your career field has paying internships. I did two well-paying internships during school (although I wasn’t smart enough to use that money toward tuition). Not every career field does this, but if it’s an option for you, you can use an internship to help pay tuition and to boost your resume. Everyone can graduate from college without student loan debt. Some of you reading this will have reasons for why you have to attend college this fall or why you have to graduate in four years. That’s fine, but don’t totally ignore the advice in the article. If you can reduce the amount of student loans you take out by even a little bit, your future self with thank you. Here’s one example: let’s say you take none of the advice and graduate with $28,4000 (the average student loan debt), with an interest rate of 3.5%. Your monthly payment will be $278 per month for 10 years. If you choose an extended repayment plan, you’ll pay $161 a month for the next 20 years. However, if you’re able to decrease your dependence on student loans by half, then you would only graduate with $14,200 in debt. With a 10-year repayment plan, you’d have monthly payments of $139 each month. A 20-year repayment plan would drop your monthly payments to just $80. Graduating debt-free sure would be nice, but your future-self will thank you for doing all you can to minimize the debt. Don’t take an all or nothing approach to your student loans. 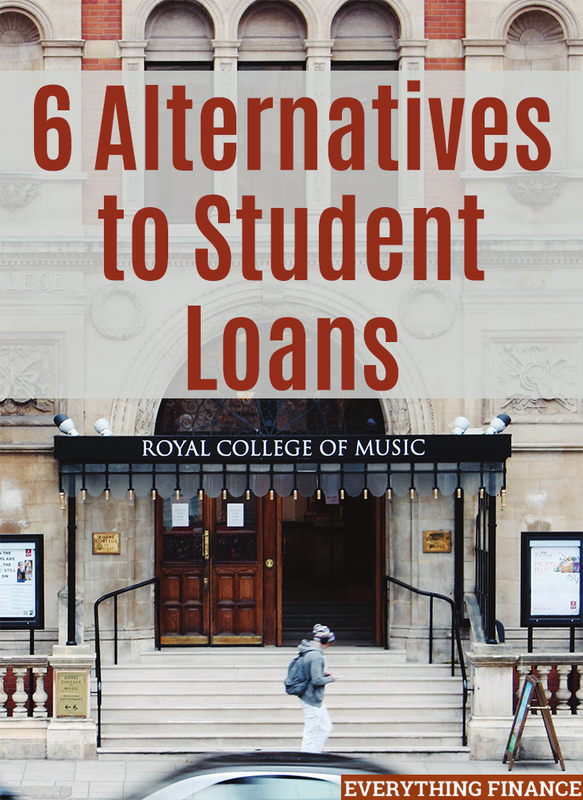 What alternatives to student loans have you used? Did you work during college, or did you have assistance from family? As a student, I found this piece really informative and interesting! Unfortunately being from a poor background, I have had no choice so far other than to take out student loans, work as much as I can outside of study and look around for grants and bursaries to help where possible. I was able to get a scholarship and work through college.This was challenging though, but the experience definitely prepared me for the outside world and equipped me with skills needed in the workforce.